Casein kinase Iϵ (CKIϵ) is an essential component of the biological clock, phosphorylating PER proteins, and in doing so regulating their turnover and nuclear entry in oscillator cells of the suprachiasmatic nucleus (SCN). Although hereditary decreases in PER phosphorylation have been well characterized, little is known about the consequences of acute enzyme inhibition by pharmacological means. A novel reagent, 4-[3-cyclohexyl-5-(4-fluoro-phenyl)-3H-imidazol-4-yl]-pyrimidin-2-ylamine (PF-670462), proved to be both a potent (IC50 = 7.7 ± 2.2 nM) and selective (>30-fold with respect to 42 additional kinases) inhibitor of CKIϵ in isolated enzyme preparations; in transfected whole cell assays, it caused a concentration-related redistribution of nuclear versus cytosolic PER. When tested in free-running animals, 50 mg/kg s.c. PF-670462 produced robust phase delays when dosed at circadian time (CT)9 (–1.97 ± 0.17 h). Entrained rats dosed in normal light-dark (LD) and then released to constant darkness also experienced phase delays that were dose- and time of dosing-dependent. PF-670462 yielded only phase delays across the circadian cycle with the most sensitive time at CT12 when PER levels are near their peak in the SCN. 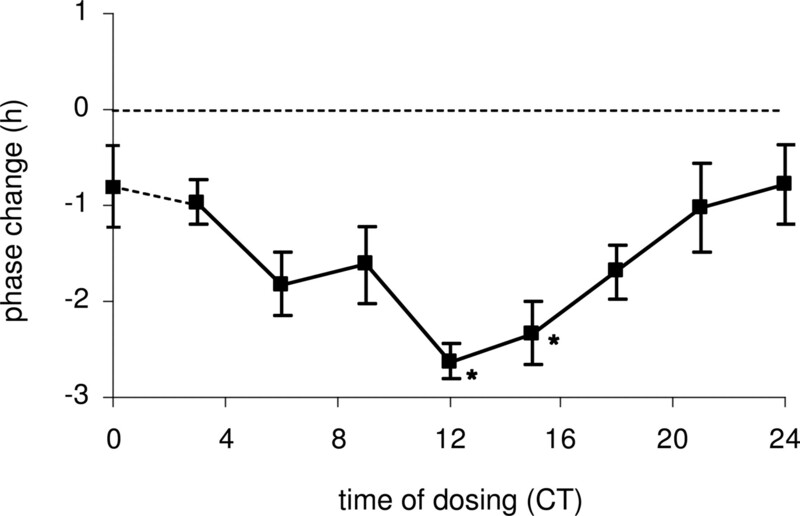 Most importantly, these drug-induced phase delays persisted in animals entrained and maintained in LD throughout the entire experiment; re-entrainment to the prevailing LD required days in contrast to the rapid elimination of the drug (t1/2 = 0.46 ± 0.04 h). Together, these results suggest that inhibition of CKIϵ yields a perturbation of oscillator function that forestalls light as a zeitgeber, and they demonstrate that pharmacological tools such as PF-670462 may yield valuable insight into clock function. Circadian behavior is mediated by a timed sequence of intracellular events, genomic in nature, occurring in mammals within so-called pacemaker cells of the suprachiasmatic nucleus (SCN) (Antle and Silver, 2005). Here, rhythmicity relies on a common theme of precisely regulated gene transcription and translation as a means to perpetuate cycling, and in doing so, to dictate the timing of downstream events (Reppert and Weaver, 2001; for review, see Schibler, 2006, among others). Clock-related proteins rise and fall in concentration as a consequence of nuclear and cytosolic feedback loops, adjusted daily to maintain reproducible cycling timed at roughly 24-h intervals. Light is the primary zeitgeber, or “time-giver”, in this process, and its actions on loop dynamics are thought to comprise the most important external influence on pacemaker function. In its simplest conception, the oscillations of the clock can run using four genes, Period (Per1, Per2) and Cryptochrome (Cry1, Cry2), that are activated in early circadian day by heterodimeric complexes of CLOCK and BMAL1 (Griffin et al., 1999; Kume et al., 1999; Cermakian and Boivin, 2003). Translated PER partners in the cytoplasm with CRY, the resultant heterodimer, readily gaining nuclear entry and opposing activation by Clock and BMAL1. A feedback loop is thus closed, and by itself could constitute the oscillation that is the oscillation of the biological clock. However, such a system would soon lose much of its robust nature were it not for some means to regulate the degradation of the clock proteins. Kinases play a critical role in this process by their capacity to phosphorylate target proteins, and in doing so, to prime them for proteasomal ubiquitination (Eide and Virshup, 2001; Eide et al., 2005; Merrow et al., 2006). Scheduled turnover of PER, for example, ensures that the repression of the feedforward path of CLOCK/BMAL1 transcription is periodically relieved. Among these kinases is casein kinase I, representing a highly conserved group within the superfamily of serine/threonine-specific kinases, with currently seven mammalian isoforms (α, β, γ1, γ2, γ3, δ, and ϵ) and their associated splice variants (Knippschild et al., 2005). Constitutively active, the enzyme phosphorylates many different substrates, including key regulatory proteins in the control of cell differentiation, proliferation, and chromosome segregation. In pacemaker cells of the SCN, the CKIϵ isoform phosphorylates PER, a priming step in its further phosphorylation and subsequent degradation (Lee et al., 2001; Akashi et al., 2002). BMAL1 and CRY are substrates as well (Eide et al., 2002), and it is noteworthy that CKIϵ is not alone in its ability to phosphorylate clock components (Eide et al., 2005). In addition to its role in ubiquitination, CKIϵ-dependent masking of nuclear localization signals on the PER proteins has been shown to control nuclear entry of PER (Vielhaber et al., 2000), in this way regulating the negative feedback that opposes its own transcription. Functionally, an alteration in the ability to phosphorylate PER results in a shortened free-running period in so-called tau mutant hamsters (Lowrey et al., 2000). 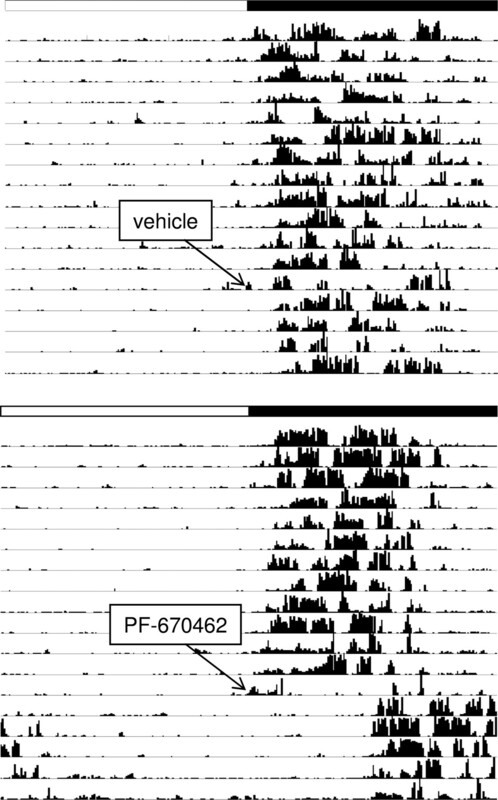 Another mutation, in this case mapped to the hPER2 phosphorylation site in humans, is responsible for the heritable sleep disorder Familial Advanced Sleep Phase Syndrome (FASPS) and its resultant morning lark phenotype (Toh et al., 2001). Pharmacological inhibition of CKIϵ has yielded surprising results, illustrating the complexities of comparing genetic manipulations to acute enzyme inhibition. In a Xenopus photoreceptor model of circadian rhythmicity, administration of SB203580, a nonselective inhibitor of CKIϵ, reset the circadian pattern of melatonin secretion as a function of phase (Hasegawa and Cahill, 2004). CKI-7, a more selective CKI inhibitor, reduced PER degradation, delayed the nuclear entry of the protein, and lengthened the duration of nuclear residence (Miyazaki et al., 2004). In vitro blockade of CKIϵ activity in a Per1-luc cell model resulted in increased period length (Camacho et al., 2003), possibly due to decreased rate of PER degradation (Eide et al., 2005). That these results are inconsistent with the constitutive decrease in phosphorylation in FASPS patients and the tau hamsters suggests that further analyses of acute enzyme loss (or inhibition) might yield valuable insight as to the importance of kinase activity in the control of oscillator function and circadian behavior in general. In this report, the actions of a novel inhibitor of CKIϵ, PF-670462, are described in isolated enzyme preparations, whole cell assays and in behaving animals and reveal a compound capable of robust changes in rhythm that are manifested independently of zeitgebers. Portions of this work have been summarized previously in abstract form (Sprouse et al., 2005). Plasmid Construction. A full-length mouse Per3 (GenBank accession no. AF50182) fused in frame to GFP was constructed as follows: mPer3 cDNA was generated by PCR from a mouse brain cDNA library (Clontech, Mountain View, CA) in two pieces representing the 5′ and 3′ ends of the coding region with the following primers: 5′-ctgtcgctgtagctcgtcacc-3′ (180–210) and 5′-aagaagccaagccaatcccggag-3′ (2054–2077) for the 5′ piece and 5′-gcccagctcgtcctatcag-3′ (1932–1950) and 5′-cagcgcccagcagaagacaccagt-3′ (3674–3697) to which an AgeI restriction site was added for the 3′-terminal piece. Each PCR fragment was cloned into a Blunt TOPO vector (Invitrogen, Carlsbad, CA) before further subcloning into the pdEGFP-N1 expression vector (Clontech). The 5′ end of mper3 was excised from the TOPO Blunt construct by digestion with XbaI and KpnI, followed by its ligation into the NheI/KpnI linearized pdEGFP-N1 to create an in frame GFP fusion. The 3′ end of the mper3 cDNA was then added to the 5′ subcloned in pdEGFP-N1 by digestion of both the 3′-TOPO Blunt construct and the 5′-pdEGFP-N1 constructs with KpnI and AgeI. A full-length human CKIϵ (GenBank accession no. AB024597) fused in frame to a polyhistidine tag was constructed as follows: CKIϵ DNA was generated by PCR from a human brain cDNA library (Clontech) using the following primers: 5′-gtgagccatggagctacgtg-3′ (105–124) and 5′-TCACTTCCCGAGATGGT-3′ (1362–1346). The PCR product was cloned into pGEM-T Easy vector (Promega, Madison, WI), excised by digestion with NsiI/ApaI and subcloned into the PstI/ApaI-linearized pcDNA4/His vector (Invitrogen). In addition, a human CKIϵΔ319 clone was generated to serve as the enzyme source for in vitro kinase assays. A 5′-BglII site and a stop codon were introduced at amino acid position 319 to eliminate the C-terminal negative autoregulatory domain. The product of the PCR reaction using primers 5′-agatctCTACGTGTGTGGGGAACAAG-3′ (118–136) and 5′-tcactaACCGAATTTCAGCATGTTCC-3′ (980–1000) was subcloned into pCR-Blunt vector (Invitrogen), excised as a BglII/NotI fragment, and ligated into a BamHI and NotI linearized pET-32 Escherichia coli expression vector containing a His/thrombin tag. All constructs were verified by DNA sequence analysis. Bacterial Expression. Competent E. coli strain BL21-Codon-Plus (DE3)-RIL was transformed with plasmid pET-CKIe or empty vector pET32, and transformants were selected on Luria-Bertani (LB) agar plates containing 100 μg/ml carbenicillin. For expression optimization studies, a fresh colony of the transformants was grown at 37°C in 50 ml of LB medium containing 100 μg/ml carbenicillin to an optical desnity600 of 0.8, at which time isopropyl-β-d-thiogalactopyranoside was added (100 μM, final concentration) to induce expression of recombinant CKIϵ. Growth was continued at 20°C for an additional 18 h. For large-scale expression and purification, an Erlenmeyer flask containing 1 liter of LB broth supplemented with 100 μg/ml carbenicillin was inoculated with 25 ml of the overnight culture (pET-CKIϵ), and the culture was grown at 37°C to an optical desnity600 of 0.8, at which time isopropyl-β-d-thiogalactoside was added (100 μM, final concentration) to induce expression, and the growth temperature was reduced to 20°C, and cells were grown for 18 h.
Cells were harvested and resuspended in 50 ml of lysis buffer (50 mM Tris, pH 8.0, 150 mM NaCl, 5% glycerol, 2 mM Tris-2-carboxyethyl phosphine, and 0.05% Triton X-100) containing 10 mg of lysozyme (50,000 U/mg; Sigma-Aldrich, St. Louis, MO). The cell suspension was incubated for 30 min at 37°C with gentle shaking, and then it was sonicated with a Branson ultrasonic disintegrator (VWR Scientific Products, Chicago, IL) for 2 to 4 min at 50% duty cycle. Cell lysate was centrifuged at 15,000 rpm for 30 min at 4°C, and the supernatant was stored at 4°C until further use. Enzyme Purification. The supernatant (50 ml) was applied to a HisTrap HP (1-ml) column (GE Healthcare, Little Chalfont, Birmingham, AL) that had been pre-equilibrated with buffer A (50 mM Tris, pH 8.0, 150 mM NaCl, 5% glycerol, 2 mM Tris-2-carboxyethyl phosphine, and 20 mM imidazole) at a flow rate of 1 ml/min. The column-bound proteins were eluted with a 25-ml linear gradient to 100% buffer B (buffer A with 250 mM imidazole) at a flow rate of 1 ml/min. Fractions of 1.0 ml in volume were collected, and they were analyzed on a SDS-10% polyacrylamide gel. The peak fractions were pooled and dialyzed overnight at 4°C against 50 mM Tris, pH 8.0, 150 mM NaCl, 5% glycerol, and 2 mM Tris-2-carboxyethyl phosphine, using a dialysis membrane with a molecular weight cut-off of 10,000. Protein concentrations were determined using either the BCA assay system (Pierce Chemical, Rockford, IL) with bovine serum albumin as a standard or using absorbance at 280 nm. Kinase Assay. The CKIϵ kinase assay was performed in a 40-μl final volume in buffer containing 50 mM Tris, pH 7.5, 10 mM MgCl2, 5 mM dithiothreitol with 5 μM ATP, 3 nM CKIϵΔ319, and 15 μM peptide substrate PLSRTLpSVASLPGL (Flotow et al., 1990) in the presence of 5 μlofCKIϵ inhibitor or 5% dimethyl sulfoxide. The reaction was incubated for 3 h at 27°C; detection was carried out as described for the Kinase-Glo Assay (Promega). Luminescent output was measured on the Wallac Envision plate reader (PerkinElmer Wallac, Gaithersburg, MD). Nuclear Translocation Assay. COS-7 cells were maintained at 37°C in 5% CO2 in Dulbecco's modified Eagle's, 10% fetal bovine serum, and penicillin, streptomycin and glutamine (1× PSG; Invitrogen). Log-phase cells were cotransfected with two plasmid DNAs, mouse Per3-GFP in pd2EGFP-N1 vector and human CKIϵ in pcDNA4/hisA vector, at a 10:1 ratio, respectively, using Lipofectamine 2000 reagent (Invitrogen) according to the manufacturer's recommendations. The transfection mix containing 80 ng of DNA and 0.3 μl of Lipofectamine 2000 in a total of 50 μl of Opti-MEM I medium (Invitrogen) was combined with 100 μl of cells in Dulbecco's modified Eagle's medium, and the mix was plated to a final density of 10,000 cells per well in poly-d-lysine-coated 96-well plates. CKIϵ inhibitor was solubilized in 100% dimethyl sulfoxide, diluted with Opti-MEM I to a 4× concentration before addition to plated cells. After overnight exposure at 37°C in a CO2 incubator, cells were fixed by the addition of 12% paraformaldehyde (Electron Microscopy Sciences, Hatfield, PA) in phosphate-buffered saline (PBS) to a final concentration of 4%, and then the cells were incubated for 30 min at 37°C. Fixative was removed, and cells were washed with PBS and then stained with 0.4 μg/ml Hoechst dye (Invitrogen) in PBS for 1 h. An additional PBS wash was carried out, and plates were stored at 4°C. A nuclear-translocation bioapplication (ArrayScan 4.0; Cellomics Inc., Pittsburgh, PA) was used for analyses: output features included mean nuclear-cytoplasmic intensity difference, valid object count, and mean nuclear intensity. Plates having an average mean nuclear intensity of <400 were excluded. Toxicity of inhibitor was assessed by valid object count. EC50 calculations were performed using XLDA (Excel; Microsoft, Redmond, WA). Approximately 4500 individual cells were analyzed for each point on the dose-response curve. Animal Preparation. All procedures were approved by Pfizer's Institutional Animal Care and Use Committee before implementation, and they were in accordance with federal policies on animal care and handling procedures. Adult male CD rats (initial weight 175–225 g; Charles River Laboratories, Inc., Wilmington, MA) were used for all experiments. After acclimating for 1 week, the rats were anesthetized with 2.5% isoflurane, and they were prepped for surgical implantation of an indwelling telemeter unit. A midline incision through skin and muscle was made in the ventral abdominal region, and a sterile telemeter (TA10TA-F40; Data Sciences International, St. Paul, MN) was inserted into the peritoneal cavity. The muscle was closed with absorbable suture, and the skin was closed with wound clips. The animals were given 5 mg/kg s.c. carprofen, and they were allowed to recover in a clean cage beneath a heating lamp. Once ambulatory, the animals were placed in their home cages, the cages were placed on matrixed receivers, and the telemeters were activated and tested on the data collection system (Dataquest Acquisition Software; Data Sciences International). Telemeters were programmed to record activity for 10 s every 5 min, and the collected data were uploaded into Matlab-based (Mathworks Inc., Natick, MA) analysis software (ClockLab; Actimetrics, Evanston, IL) containing algorithms to determine and predict activity onsets and associated circadian parameters. Each cage contained a running wheel to encourage activity (although these data were not captured), and it was housed within a light-tight isolation chamber (four cages/box; Plastic Design, Inc., Burlington, MA) with constant ventilation. Lighting for each box was set at 250 to 300 lux, and the light cycle was controlled with a timer (Chrontrol, San Diego, CA). The timing of lights on and off in each box was also recorded and checked daily. The rats were kept in LD12:12 for at least 2 weeks after recovery from transmitter implantation surgery and before the initiation of the study to ensure stable entrainment. Experimental Protocols. In experiment 1, animals were released into constant darkness (DD) for 2 weeks, and their individual free-running periods and times of activity onset were determined from the 7 to 10 days at the end of the 2-week period. Dosing of 50 mg/kg PF-670462 or vehicle (40% β-cyclodextrin) took place at circadian time (CT)9 or 3 h before the predicted onset of activity; night vision goggles (Cabela's, Sidney, NE) facilitated the subcutaneous administration. CT9 was chosen based on preliminary data demonstrating robust responses to CKIϵ inhibition at this circadian time. Animals were maintained under DD for an additional 4 to 5 days postdose, and the data from that time period were used in the estimation of the magnitude and direction of the putative phase shifts. In experiment 2, animals were released into DD at zeitgeber time (ZT)12, the time of the normal offset of light, following 2 weeks of acclimation in LD12:12. With the aid of night vision goggles, PF-670462 or vehicle was then administered 21 h later at ZT9, in this case essentially equal to CT9 given the rats' tau of approximately 24 h. Various doses of PF-670462 (25, 50, and 100 mg/kg s.c.) were given at this same circadian time to generate a dose-response curve (n = 3–5 for each dose). As in experiment 1, animals remained under DD for 4 to 5 days post-treatment to provide an estimation of the magnitude and direction of the phase shifts. Preliminary experiments had shown this protocol, a release to DD from LD, to yield results no different from that obtained in DD throughout. In experiment 3, animals were treated in a very similar manner to that in experiment 2 with the exception that the dose of the compound was held constant (50 mg/kg s.c.) and the time of dosing was adjusted to probe for drug effects at various ZTs (0, 3, 6, 9, 12, 15, 18, and 21). In each case, the rats were released into DD at ZT12 on the day of dosing, and the drug was given within the first 24 h with ZT approximating CT as before; night vision goggles again aided in the dosing portion of the experiment. Phase shifts were calculated using activity onsets from the first 4 to 5 days of DD following dosing. The phase-response curve thus generated was based on the time of PF-670462 administration, not on its peak effect in terms of drug levels in brain or in terms of the degree of enzyme inhibition. In experiment 4, the dose (50 mg/kg s.c.) and the time of dosing (ZT12) of PF-670462 or vehicle were held constant, with the lighting conditions following dosing as the experimental variable. Maintained under LD12:12 for at least 2 weeks, animals entered their normal dark phase postdose; one group of animals was kept in DD, whereas a second group of animals continued to be exposed to a LD12:12 photoperiod. ZT12 was selected for the time of dosing based on the earlier phase-response results obtained in experiment 3. Finally, a satellite group of rats was dosed with 25 mg/kg s.c. PF-670462 to determine compound exposure and time course. Plasma samples were taken at 0.5, 1, 2, 4, and 6 h after dosing, and compound concentrations were determined by mass spectrometry. An additional group of animals was dosed and euthanized 1 h later to enable compound determinations in both the brain and plasma compartments. Analysis. The magnitude of phase shifts was calculated based on computer-assisted estimations of activity onsets in the 4 to 5 days before and after drug was given using changes in mean bin activity counts over threshold (ClockLab). For the prediction of specific CTs in free-running animals maintained in DD throughout the study (experiment 1), tau was calculated for the preceding 7- to 10-day period, and the prediction function of the analysis program was used to predict CT12 on the following day (i.e., the software extended the slope of the free-running period to the next day allowing for an accurate prediction of activity onset for the next 24 h). For animals transitioned into DD at the normal onset of the dark phase (experiments 2–4), the time of dosing corresponded to the ZT as determined by the previous LD cycle for each animal. The magnitude of the treatment-induced phase shifts was calculated based on computer-assisted estimations of activity onsets in the 4 to 5 days before and after drug was given. The algorithm used predicts daily activity onsets based on a bout of (at least) 10-min duration, with an amplitude of (at least) the mean activity of the preceding 24 h. The onset must precede (at least) 12 h of relative activity and follow (at least) 10 h of inactivity. All phase shifts were then expressed in circadian hours. Mean phase shifts for each treatment group were compared for statistical significance using the appropriate between-subjects analyses of variance with post hoc tests: Student's t test for comparison of the vehicle-treated group to those treated with drug (experiment 1) or the Student-Newman-Keuls (SNK) test for multiple comparisons (experiments 2–4). Values were considered significant if p < 0.05. 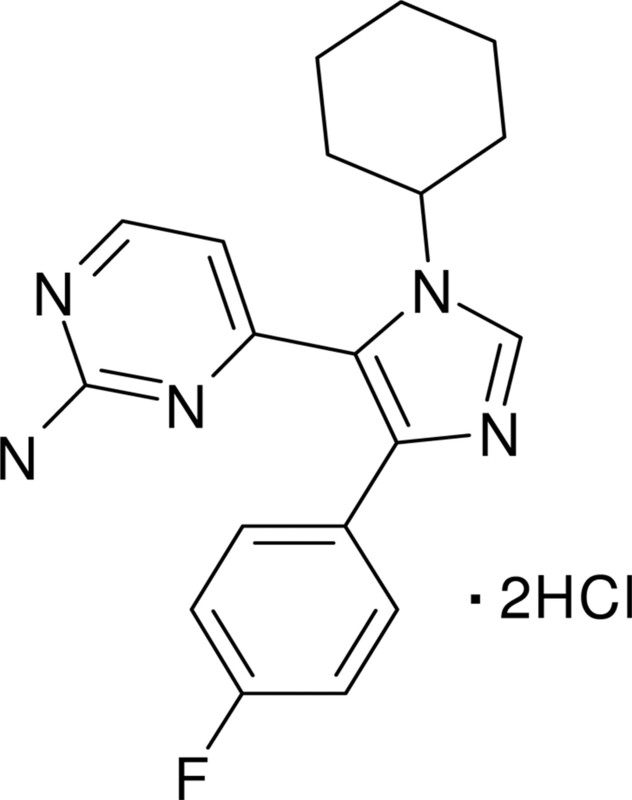 PF-670462 was synthesized by the Department of Medicinal Chemistry (Pfizer Global Research and Development). D4476, CKI-7, and ICS261 were obtained from commercial sources [Calbiochem (San Diego, CA) and Sigma-Aldrich]. Inhibition of CKIϵ by PF-670462 in Vitro. As part of an internal effort to identify novel inhibitors of CKIϵ, a high-throughput screen of a variety of chemical matter was conducted, and it yielded a number of “hits”; minor chemical modification of one of these hits produced PF-670462 (Fig. 1). In assays of enzyme inhibition, potency for PF-670462 fell within the nanomolar range (IC50 = 7.7 ± 2.2 nM; n = 5), substantially greater than that observed for CKI inhibitors profiled previously (Table 1): CKI-7 (Chijiwa et al., 1989), ICS261 (Behrend et al., 2000), and D4476 (Rena et al., 2004). IC50 value determinations among 45 additional kinases provided relevant selectivity profiling: assays with 23 of these kinases yielded IC50 values in excess of 30 μM, an additional 14 kinases displayed IC50 values greater than 3.0 μM, and a further group of five kinases were determined to have potencies in excess of 0.3 μM. Only with three kinases did PF-670462 display less than 30-fold selectivity: CKIδ, EGFR, and p38 (Table 2). Among this last group, the lack of selectivity with respect to CKIδ may be significant, because this isoform also seems to be involved in PER phosphorylation within the SCN (Xu et al., 2005; Loudon, 2006), whereas EGFR (Vadigepalli et al., 2006) and p38 (Coogan and Piggins, 2004) may also play roles in SCN function. 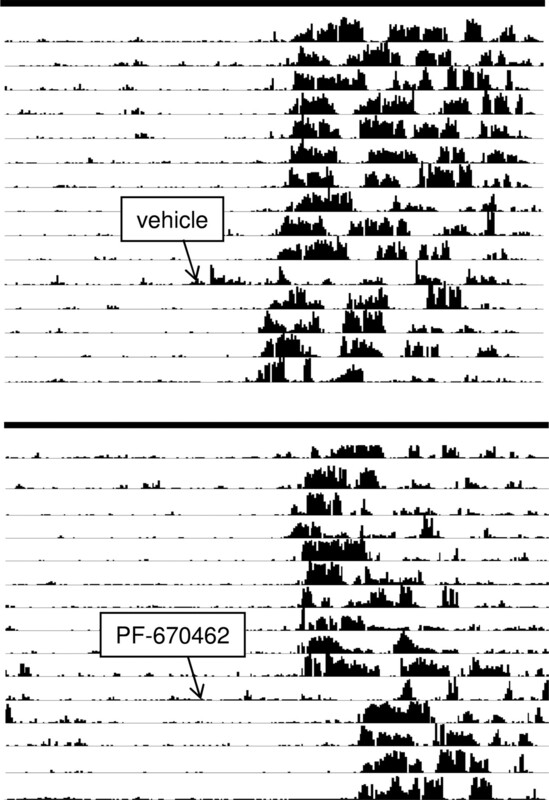 A selectivity panel probing for potential interactions with receptors, transporters, or other enzymes (116 in total) revealed no significant interactions for PF-670462 (data not shown). Data represent the mean ± S.E.M. for n = 3 to 5 determinations. Inhibition of PER3 Nuclear Translocation by PF-670462. The role of CKIϵ in phosphorylating substrate PER proteins and thereby enabling nuclear PER translocation served as the basis for a whole cell functional assay. COS-7 cells were transiently cotransfected with constructs encoding an N-terminal GFP-tagged PER3 and the human CKIϵ enzyme. Under these conditions, the GFP-tagged PER3 construct preferentially accumulates in the nucleus of cells 24 h post-transfection (Fig. 2A). The intensity of nuclear and cytoplasmic GFP signal was measured using an automated image analysis platform (ArrayScan; Cellomics) with the resultant regional fluorescence intensities used to calculate a mean nuclear-cytoplasmic intensity difference and thus serving as a measure of intracellular translocation. 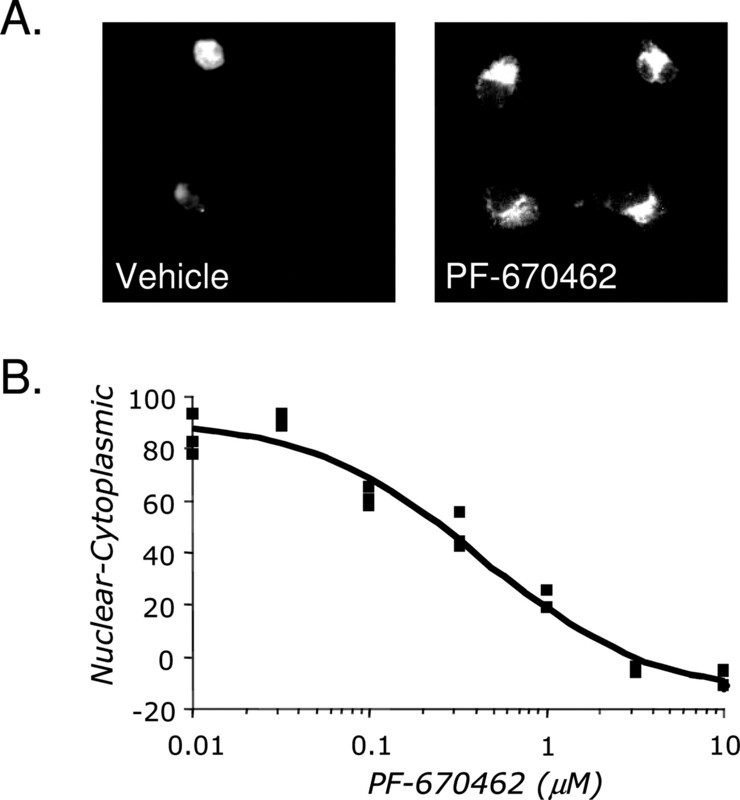 Cells treated with PF-670462 showed a concentration-dependent redistribution of the GFP signal to the cytoplasm (Fig. 2B), consistent with requisite CKI-mediated phosphorylation for nuclear entry (Akashi et al., 2002). Analysis of the concentration-response curve yielded an EC50 value for PF-670462 (290 ± 39 nM; n = 6), larger than that generated in the enzymatic assay (IC50 = 7.7 nM) but consistent with potency shifts typically observed when using whole cells. EC50 values for literature CKI inhibitors were considerably larger (Table 1). Phase-Shifting Actions of PF-670462 in Vivo in Constant Darkness. Animals entrained to a 12:12-h photoperiod were released into constant darkness at least 2 weeks before testing. CT was established on an individual basis by examination of the actograms or locomotor records; dosing of PF-670462 or vehicle at CT9 was chosen based on preliminary studies. 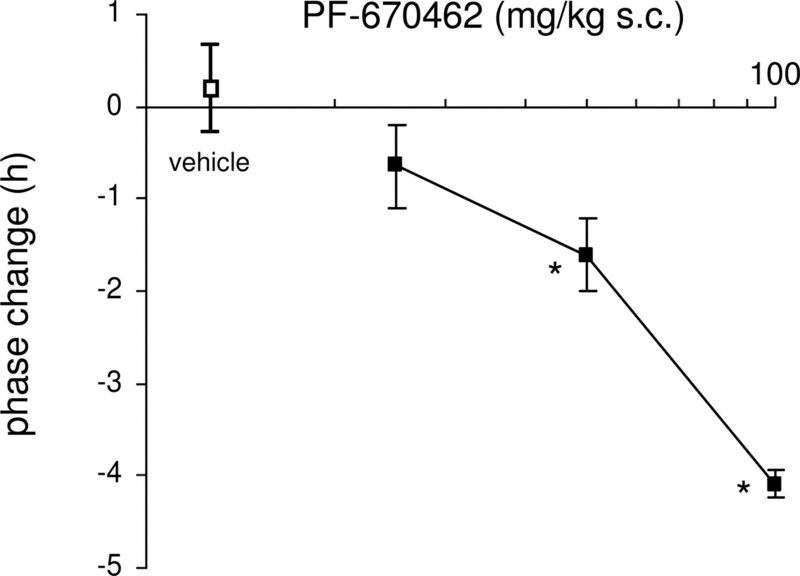 Compared with vehicle controls, 50 mg/kg s.c. PF-670462 produced robust phase delays (–1.97 ± 0.17 versus –0.40 ± 0.22 h; n = 5 for each group; p < 0.0005) that were evident on the first circadian cycle after dosing (Fig. 3), the minus sign for this value following the convention in which phase delays are considered as occurring in a negative direction. Lengthening of tau, the duration of the free-running period, occurred on the day of the phase delay, in each instance by an amount equivalent to the magnitude of the phase shift. In general, however, drifts in activity onsets were similar before and after drug treatment such that estimates of tau did not differ in the PF-670462-dosed animals once the phase shift had been established (23.94 versus 23.99 h). Activity onsets following the dose of PF-670462 remained unchanged indicating no reversal of the phase delay in the absence of exogenous zeitgebers. Functional EC50 determination of PF-670462 in CKIϵ-transfected COS7 cells using nuclear translocation of a GFP-tagged PER3 construct. A, cells cotransfected with GFP-PER3 and CKIϵ exhibit nuclear localization of GFP-PER3 (left; vehicle). Treatment of transfected cells with PF-670462 results in a redistribution of GFP-PER3 to the cytoplasm (right; PF-670462). B, quantification of the redistribution of GFP-PER3 using nuclear-cytoplasmic intensity as an index of redistribution results in a concentration response curve for PF-670462 yielding an EC50 of 290 ± 39 nM (n = 6). Daily records of locomotor activity in free-running rats showing the effects of PF-670462 dosing. Animals were maintained in constant darkness for 2 weeks before the start of the experiment; thereafter, activity onsets culled from the actograms revealed free-running behavior with an endogenous period length (tau) of 23.94 h. Dosing of vehicle (top) at CT9 (arrow) on the 11th day of recording produced little changes in subsequent activity onsets, whereas dosing of 50 mg/kg s.c. PF-670462 (bottom) produced robust phase delays, in this actogram amounting to nearly 3 h. Activity onsets on the days following dosing of PF-670462 showed a persistent pattern, indicating no discernible correction of the delay in the absence of exogenous zeitgebers. Actograms demonstrating the phase-shifting effects of PF-670462 in light-entrained rats released into constant darkness. Animals maintained in LD12:12 were switched to conditions of constant darkness at ZT12, dosed with vehicle (top) or PF-670462 (bottom) at the subsequent CT9, and then maintained in DD throughout the remainder of the experiment. Shown are representative results of the 100 mg/kg s.c. dose, yielding a phase delay of approximately 4 h. No correction to light entrainment is evident in DD. Dose Dependence PF-670462-Induced Phase Shifts. Animals were entrained to the LD12:12 cycle for a minimum of 2 weeks or until stable entrainment was established. On the day of dosing, animals were released into DD at ZT12, the normal time of lights-off, and they were dosed at the subsequent CT9 with vehicle or PF-670462 (Fig. 4). During this period, ZT was essentially equivalent to CT given that dosing occurred within 24 h of lights-off and that the calculated tau for a similarly treated group of animals closely approximated 24 h (experiment 1). Analysis of the magnitude of phase shifts in response to varying doses of PF-670462 (25, 50, and 100 mg/kg s.c.) revealed a significant overall effect of dose [F(3,11) = 39.41; p < 0.00001] (Fig. 5). Post hoc analyses using the SNK test revealed that the 50- and 100-mg/kg doses of PF-670462 induced a significant phase delay compared with vehicle treatment (p < 0.01) and that increasing the dose of compound resulted in significant increases in the magnitude of the phase delay (i.e., the 50- and 100-mg/kg doses were also different from the 25-mg/kg dose, and they were different from each other; p < 0.01). The magnitude of the phase shift at the 50-mg/kg dose of PF-670462 using this lighting protocol (–1.61 ± 0.40 h) was indistinguishable from that obtained using the same dose and time of dosing under DD conditions (–1.97 ± 0.17 h), suggesting that the behavioral effects were not influenced by earlier entrainment to LD12: 12. Dose-response relationship of systemic PF-670462 administration to the magnitude of the behavioral phase shifts. Shown are group means ± S.E.M. (n = 3–5/dose) for doses given at CT9 (see Fig. 4 for representative actograms). By convention, phase delays are recorded as negative phase changes; advances, as in the case of the small advance evident in the vehicle-treated rats, are designated in the positive direction. Asterisks indicate significant differences (p < 0.01) in the phase delays of animals receiving the 50- and 100-mg/kg doses, significant differences relative to vehicle and to the 25-mg/kg dose, and differences from each other. Phase-response curve generated in response to the timed administration of PF-670,462. Rats previously entrained to light were released into constant darkness at ZT12; dosing with PF-670462 followed at various CTs within the first 24 h of DD, and data are shown as the mean ± S.E.M. (n = 3–20). Asterisks indicate significant differences (p < 0.01) when dosing occurred at CT12 and CT15 relative to the minimum shift observed at CT0/24; only trends were evident at the other dosing times. Phase Dependence of PF-670462-Induced Shifts. As with the experiment outlined above, the paradigm for this portion of the study also required established entrainment of the animals to the normal LD cycle and then release into DD after ZT12 on the day of dosing, regardless of dosing time. Animals were administered 50 mg/kg s.c. PF-670462 at CTs 0/24, 3, 6, 9, 12, 15, 18, and 21 (Fig. 6). Data analyses revealed a significant effect of drug on activity onset [F(7,46) = 5.07; p < 0.0005] with tests for multiple comparisons (SNK) revealing a significant phase delay at CT12 and CT15 (relative to CT0/24) and trends at other times of administration. No phase advances were noted. Comparison of PF-670462-Induced Phase Shift Magnitude under LD and DD Conditions. To determine whether PF-670462 could produce phase delays in the presence of a zeitgeber, two different lighting paradigms were used. The first regime followed the previously described release of LD-entrained animals into DD just before dosing and then maintained in DD throughout the remainder of the experiment. In the second manipulation, light-entrained animals were dosed in LD and left on this light cycle after dosing. All animals received vehicle or 50 mg/kg s.c. PF-670462 at CT12 (DD animals) or ZT12 (LD animals), and they were monitored for several days postdosing (Fig. 7). As in the earlier experiments, there was a significant overall effect of drug treatment [F(3,29) = 12.16; p < 0.00005], and post hoc analyses (SNK) revealed a dose-dependent phase delay to dosing of PF-670462 under both DD and LD conditions (Fig. 8). In the group experiencing LD throughout the study, activity onsets during the days following dosing did not rapidly return to ZT12; rather, they seemed to approach lights-off by making small advances each day (Fig. 7). With respect to the magnitude of the phase shift, no significant difference was observed between animals on DD or LD for those receiving the vehicle or 50-mg/kg doses (Fig. 8). Pharmacokinetics of PF-670462. Determination of brain and plasma levels of PF-670462 following a dose of 25 mg/kg s.c. in a parallel group of animals (n = 4) yielded a brain/plasma ratio of 0.88 ± 0.07, a plasma Tmax of ≤0.5 h, and a plasma elimination t1/2 of 0.46 ± 0.04 h.
Within pacemaker cells of the SCN, the rising and falling of clock protein levels is the result of the forces aligned to set the rate of protein production and degradation. PER production, as set by promotion of Per and Cry transcription by the CLOCK/BMAL complex, is a feedback target of the phosphorylated form of the PER-CRY heterodimer. The rate of protein degradation, the other dynamic in determining protein steady state, features another important role for phosphorylation, in this instance priming proteasomal ubiquination. It would seem then that a single kinase activity, phosphorylation of the PER by CKIϵ, potentially keys two functions in regulating the clock gene protein levels that constitute internal timekeeping. Naturally occurring abnormalities in this enzyme function, either by an alteration in substrate (FASPS) or by an alteration in the enzyme itself (tau mutant hamsters), result in abnormalities of circadian rhythmicity manifested as changes in period length and phase. The purpose of the present study was to examine the effect of acute loss of CKIϵ function in an otherwise normal animal by the use of a potent and selective enzyme inhibitor and to relate the observed changes to working models of clock function. 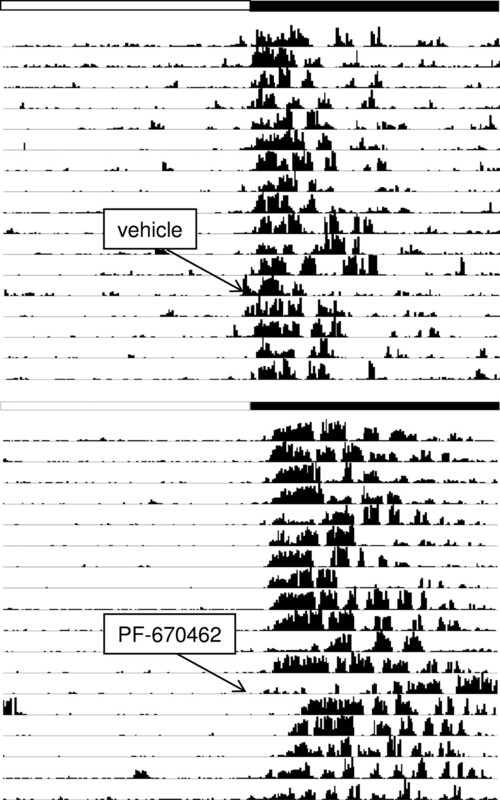 Actograms demonstrating the phase-shifting effects of PF-670462 in rats maintained in LD12:12. Animals were light-entrained for 2 to 3 weeks, and then they were placed into one of two light paradigms: a switch to DD at ZT12 or maintenance in LD12:12 for the duration of the experiment. Dosing with either vehicle or 50 mg/kg s.c. PF-670462 occurred at CT12 for those rats released into DD and at ZT12 for those who experienced LD12:12 throughout. In the actograms shown, the light-entrained animal maintained in LD12:12 showed a negligible change in phase after dosing with vehicle (top); by contrast, dosing with PF-670462 produced a robust phase delay (bottom), in this case, of approximately 2 h. Note gradual return to entrained behavior in the days following dosing. PF-670462-induced phase delays in rats maintained in LD12:12. Graph depicts the mean ± S.E.M. (n = 4–13) of light-entrained animals switched to constant darkness and those held in LD12:12 throughout the experiment, in each lighting paradigm given either vehicle or 50 mg/kg s.c. PF-670462 at CT12 or ZT12 (see Fig. 7 for representative actograms). 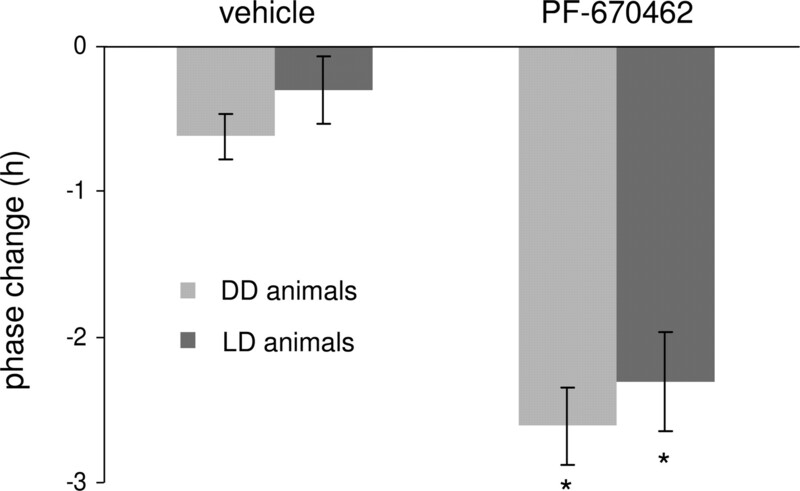 Asterisks indicate significant differences (p < 0.01) between the vehicle-treated and PF-670462-treated groups in both DD and LD; no differences were noted between lighting paradigms following dosing of vehicle or drug. As with any pharmacological tool, the value of PF-670462 is largely judged by its ability to penetrate to its intended site of action and once there to act potently and selectively and with measurable efficacy. For PF-670462, its ready access to the central nervous system is confirmed by a pharmacokinetic profile that ensures good central exposure. In isolated enzyme preparations, its IC50 value relative to CKIϵ activity was less than 10 nM; in whole cell assays, it produced a redistribution of nuclear/cytosolic PER in a concentration-dependent manner. In vivo, the actions of PF-670462 were again quite robust with administration producing shifts in daily activity onsets measured in hours; importantly, these were dose-dependent and time of dosing-dependent and only delayed in nature. Perhaps most remarkably these pharmacological effects remained robust in entrained animals with no discernible difference in the magnitude of the shift under LD or DD conditions. In terms of selectivity, the actions of PF-670462 are known to extend to CKIδ, EGFR, and p38, each of which is capable of playing a role in clock gene function (Coogan and Piggins, 2004; Xu et al., 2005; Loudon, 2006; Vadigepalli et al., 2006). In particular, activity at CKIδ may be critical to the effects observed as transgenic mice lacking the ϵ isoform exhibit quite normal rhythms, presumably as a result of a compensating increase in CKIδ function (Loudon, 2006). Consequently, the lack of selectivity of PF-670462 may be fortuitous, if not intentional, and inhibition of both ϵ and δ may be the key to its robust effects. Beyond kinase selectivity, there is the issue of substrate specificity as the effects of CKIδ/ϵ inhibition by PF-670462 may affect phosphorylation of other clock proteins (BMAL1, CRY) as well (Eide et al., 2002). Although the net effect of PF-670462 on circadian behavior seems quite simple—robust, dose-and phase-dependent delays in activity onsets independent of lighting conditions—the precise effect at the level of the molecular oscillator is far more difficult to judge and perhaps only discernible with mathematical modeling techniques. Other aspects of the pharmacokinetic profile of PF-670462—rapidly attained plasma levels and brief pharmacokinetic t1/2—are key to interpreting the present findings. By inference, peak brain levels would also occur rapidly, and assuming similar elimination kinetics in plasma and brain, drug levels within the SCN should fall to near zero within 5 to 6 t1/2 values or 2.5 to 3 h. As is clear from the actograms for animals dosed and maintained in LD (Fig. 6), the effect on phase is most clearly evident the day after dosing, and it takes time measured in days to recover to entrained conditions. This circumstance is greatly accentuated in animals tested in DD in whom phase delays seem permanent in the absence of environmental cues (Fig. 3). Using activity onsets as the dependent measure, pharmacodynamic t1/2 seems to far outstrip pharmacokinetic t1/2, because the zeitgeber effects of light take longer to work than the endogenous enzymes responsible for metabolizing PF-670462. Adjustments back to light-entrained conditions are made gradually in the form of modest phase advances that accumulate with passing days. The apparent difference in the pharmacokinetic versus pharmacodynamic t1/2 of PF-670462 raises interesting questions. If the effect of the drug extends into days, what would happen to the magnitude and time course of phase delays upon repeated dosing? Preliminary experiments with a chronic once-daily dosing protocol (Sprouse et al., 2006) reveal phase delays that become additive. In these animals, the time elapsed between doses is considerably shorter than the time required for complete re-entrainment (and yet it far exceeds that to produce an accumulation of the drug in the brain or plasma compartments). What accounts for the dose-response aspects of the phase delays? Is it the extent of enzyme inhibition as a function of dose or the time the enzyme spends in an inhibited state, or, to complete the possibilities, a bit of both? Again, the chronic dosing studies suggest that pulsatile exposure may well represent the ideal profile for a chronobiotic. Plasma t1/2 values approaching the length of the solar day may not allow for normal cycling and invite compensation through alternative/additional clock protein feedback pathways. In phase-response analyses of the present data, only delays were observed, essentially the same as those reported earlier in in vitro studies (Camacho et al., 2003). A delay in the degradation of PER and thus a delay in the progression of the clock cycle, as these authors note, would yield a lengthening of tau and delays in phase. Among the present data, the most robust of these delays seems to occur near the light-dark transition, coinciding roughly with the time of peak levels of PER protein (Hastings et al., 1999; Field et al., 2000). The precise relationship is difficult to address as the phase-response relationship is based on the time of dosing and not on the time of peak enzyme inhibition or the duration of that inhibition, neither of which are known. This interpretation of the time-effect relationship, of course, presumes that the actions of PF-670462 are occurring at the level of the SCN and that any actions on peripheral oscillators (Balsalobre, 2002; Peirson et al., 2006) do not contribute significantly to the behavioral effect (even though they may be affected in much the same manner). Such seems to be the case based on preliminary data with a close structural analog of PF-670462 that produces phase delays of similar magnitude following i.c.v. administration (M. Rea and E. T. Weber, personal communication). The clear direction of the phase shifts elicited by PF-670462 underscores apparent discrepancies with data from tau mutant hamsters. In these animals, enzymatic hypofunction would seem to be at the root of the effects observed, essentially a shortened tau accompanied by phase advances (Lowrey et al., 2000). A recent report, however, makes quite the opposite case (Gallego et al., 2006). Here, mathematical modeling of the mammalian circadian clock revealed an apparent gain of function rather than a loss in that the mutant form of the kinase yields a greater degree of PER phosphorylation. CKIϵtau was shown to increase the in vivo phosphorylation of PER1 and PER2 and enhance their degradation, whereas phosphorylation of other protein substrates actually followed the earlier accepted notion of a loss of function. With this interpretation in hand, it seems quite reasonable that the tau hamsters and the PF-670462-treated rats should provide opposing results. Where an inconsistency remains is with FASPS patients, although its root cause may lie in the nature of the hypophosphorylation, a permanent aberration in PER in the case of the FASPS patients and a short-term competitive loss of enzyme function in the case of the present work. What would be the potential clinical utility of a CKIϵ inhibitor? Given the ubiquitous nature of circadian rhythms, poor rhythmic functioning would logically result in poor general functioning. Such seems to be the case based on the consensus of a number of published reviews (Bunney and Bunney, 2000; Wisor, 2002; Sprouse, 2004), and the task may be one of sorting through a long list of possibilities, ranging from the cognitive deficits in shift workers to the sundowning symptomatic of severely affected Alzheimer's disease patients. What is required in the sorting is a chemical tool with good pharmaceutical properties that may be used as a research tool in small clinical studies. PF-670462, with robust efficacy and a potentially advantageous pulsatile exposure, might represent such a chemical/research tool, although further chemical modifications of the core structure could possibly yield a compound with greater kinase selectivity. Questions yet to be addressed are also the most fundamental: What constitutes proper functioning of the central pacemaker and what can be done to achieve this through pharmacological means? And more related to the discussion here, is CKIϵ inhibition such a means? ABBREVIATIONS: SCN, suprachiasmatic nucleus; CKI, casein kinase I; FASPS, familial advanced sleep phase syndrome; SB203580, 4-(4-fluorophenyl)-2-(4-methylsulfinylphenyl)-5-(4-pyridyl)1H-imidazole; PF-670462, 4-[3-cyclohexyl-5-(4-fluoro-phenyl)-3H-imidazol-4-yl]-pyrimidin-2-ylamine; GFP, green fluorescent protein; PCR, polymerase chain reaction; LB, Luria-Bertani; PBS, phosphate-buffered saline; LD, light dark cycle; DD, constant darkness; CT, circadian time; ZT, zeitgeber time; SNK, Student-Newman-Keuls, EGFR, epidermal growth factor receptor; PK, protein kinase; D4476, 4-[4-(2,3-dihydro-benzo[1,4]dioxin-6-yl)-5-pyridin-2-yl-1H-imidazol-2-yl] benzamide; CKI-7, N-(2-aminoethyl)-5-chloroisoquinoline-8-sulfonamide; ICS261, 3-[(2,4,6-trimethoxyphenyl)methylidenyl]-indolin-2-one. Akashi M, Tsuchiya Y, Yoshino T, and Nishida E (2002) Control of intracellular dynamics of mammalian period proteins by casein kinase I ϵ (CK1ϵ) and CK1δ in cultured cells. Mol Cell Biol 22: 1693–1703. Antle MC and Silver R (2005) Orchestrating time: arrangements of the brain circadian clock. Trends Neurosci 28: 145–151. Balsalobre A (2002) Clock genes in mammalian peripheral tissues. Cell Tissue Res 309: 193–199. Behrend L, Milne DM, Stoter M, Deppert W, Campbell LE, Meek DW, and Knippschild U (2000) IC261, a specific inhibitor of the protein kinases casein kinase 1-delta and -epsilon, triggers the mitotic checkpoint and induces p53-dependent postmitotic effects. Oncogene 19: 5303–5313. Bunney WE and Bunney BG (2000) Molecular clock genes in man and lower animals: possible implications for circadian abnormalities in depression. Neuropsychopharmacology 22: 335–345. Camacho F, Hurst WJ, Veilhaber E, Harnish S, Roehr J, Friedman E, Menaker M, Khorkova O, Virsul D, and Giovanni A (2003) Casein kinase I and circadian rhythms: effects of manipulation of CK1ϵ on period. 33rd Annual Meeting of the Society for Neuroscience; 2003 Nov 8–12; New Orleans, LA. Society for Neuroscience, Washington, DC. Cermakian N and Boivin D (2003) A molecular perspective of human circadian disorders. Brain Res Rev 42: 204–220. Chijiwa T, Hagiwara M, and Hidaka H (1989) A newly synthesized selective casein kinase I inhibitor, N-(2-aminoethyl)-5-chloroisoquinoline-8-sulfonamide, and affinity purification of casein kinase I from bovine testis. J Biol Chem 264: 4924–4927. Coogan AN and Piggins HD (2004) MAP kinases in the mammalian circadian system–key regulators of clock function. J Neurochem 90: 769–775. Eide EJ, Vielhaber EL, Hinz W, and Virshup DM (2002) The circadian regulatory proteins BMAL1 and cryptochromes are substrates of casein kinase Iϵ. J Biol Chem 277: 17248–17254. Eide EJ and Virshup DM (2001) Casein Kinase I: another cog in the circadian clockworks. Chronobiol Int 18: 389–398. Eide EJ, Woolf MF, Kang H, Woolf P, Hurst W, Camacho F, Vielhaber EL, Giovanni A, and Virshup DM (2005) Control of mammalian circadian rhythm by CKIϵ-regulated proteasome-mediated PER2 degradation. Mol Cell Biol 25: 2795–2807. Field MD, Maywood ES, O'Brien J, Weaver DR, Reppert S, and Hastings MH (2000) Analysis of clock proteins in mouse SCN demonstrates phylogenetic divergence of the circadian clockwork and resetting mechanism. Neuron 25: 437–447. Flotow H, Graves PR, Wang AQ, Fiol CJ, Roeske RW, and Roach PJ (1990) Phosphate groups as substrate determinants for casein kinase I action. J Biol Chem 265: 14264–14269. Gallego M, Eide EJ, Woolf MF, Virshup DM, and Forger DB (2006) An opposite role for tau in circadian rhythms revealed by mathematical modeling. Proc Natl Acad Sci U S A 103: 10618–10623. Griffin EA, Staknis D, and Weitz CJ (1999) Light-independent role of CRY1 and CRY2 in the mammalian circadian clock. Science 286: 768–771. Hasegawa M and Cahill GM (2004) Regulation of the circadian oscillator in Xenopus retinal photoreceptors by protein kinases sensitive to the stress-activated protein kinase inhibitor, SB 203580. J Biol Chem 279: 22738–22746. Hastings MH, Field MD, Maywood ES, Weaver DR, and Reppert SM (1999) Differential regulation of mPER1 and mTIM proteins in the mouse suprachiasmatic nuclei: new insights into a core clock mechanism. J Neurosci 19: RC11–RC17. Knippschild U, Gocht A, Wolff S, Huber N, Löhler J, and Stöter M (2005) The casein kinase 1 family: participation in multiple cellular processes in eukaryotes. Cell Signal 17: 675–689. Kume K, Zylka MJ, Sriam S, Shearman LP, Weaver DR, Jin X, Maywood ES, Hastings MH, and Reppert SM (1999) mCRY1 and mCRY2 are essential components of the negative limb of the circadian clock feedback loop. Cell 98: 193–205. Lee C, Etchegaray J-P, Cagampang FRA, Loudon ASI, and Reppert SM (2001) Posttranslational mechanisms regulate the mammalian circadian clock. Cell 107: 855–867. Loudon A (2006) The tau mutation in mice and hamsters. Tenth Meeting Program, Society for Research on Biological Rhythms; 2006 May 21–25; Sandestin, FL. Society for Research on Biological Rhythms, Sandestin, FL. Lowrey PL, Swhimomura K, Antoch MP, Yamazaki S, Zemenides PD, Ralph MR, Menaker M, and Takahashi JS (2000) Positional syntenic cloning and functional characterization of the mammalian circadian mutation tau. Science 288: 483–490. Merrow M, Mazzotta G, Chen Z, and Roenneberg T (2006) The right pace at the right time: regulation of daily timing by phosphorylation. Genes Dev 20: 2629–2633. Miyazaki K, Nagese T, Mesaki M, Narukawa J, Ohara O, and Ishida N (2004) Phosphorylation of clock protein PER1 regulates its circadian degradation in normal human fibroblasts. Biochem J 380: 95–103. Peirson SN, Butler JN, Duffield GE, Takher S, Sharma P, and Foster RG (2006) Comparison of clock gene expression in SCN, retina, heart and liver of mice. Biochem Biophys Res Commun 351: 800–807. Rena G, Bain J, Elliott M, and Cohen P (2004) D4476, a cell-permeant inhibitor of CK1, suppresses the site-specific phosphorylation and nuclear exclusion of FOXO1a. EMBO Rep 5: 60–65. Reppert SM and Weaver DR (2001) Molecular analysis of mammalian circadian rhythms. Annu Rev Physiol 63: 647–676. Schibler U (2006) Circadian time keeping: the daily ups and downs of genes, cells, and organisms. Prog Brain Res 153: 271–282. Sprouse J (2004) Pharmacological modulation of circadian rhythms: a new drug target in psychotherapeutics. Expert Opin Ther Targets 8: 25–38. Sprouse J, Holland J, Tate B, Kleiman R, Adamowicz W, St. Germain K, Berke H, Claffey M, Beattie-Swanson T, Sawaryn C, et al. (2005) Casein kinase Iϵ inhibitor induces phase delays in telemeterized rats under entrained and free-running conditions. 35th Annual Meeting of the Society for Neuroscience; 2005 Nov 12–16; Washington, DC. Society for Neuroscience, Washington, DC. Sprouse J, Tate B, Holland J, Kleiman R, Beattie-Swanson T, Reynolds L, Cianfrogna J, Nelson F, and Badura L (2006) Chronic dosing with an inhibitor of casein kinase Iϵ induces robust phase delays in the activity onsets of light-entrained rats. 36th Annual Meeting of the Society for Neuroscience; 2006 Oct 14–18; Atlanta, GA. Society for Neuroscience, Washington, DC. Toh KL, Jones CR, He Y, Eide EJ, Hinz DM, Virshup DM, Ptacek LJ, and Fu YH (2001) An hPer2 phosphorylation site mutation in familial advanced sleep phase syndrome. Science 291: 1040–1043. Vadigepalli R, Hao H, Miller GM, Liu H, and Schwaber JS (2006) Epidermal growth factor receptor-induced circadian-time-dependent gene regulation in suprachiasmatic nucleus. Neuroreport 17: 1437–1441. Vielhaber E, Eide E, Gao Z-H, and Virshup DM (2000) Nuclear entry of the circadian regulator mPER1 is controlled by mammalian casein kinase I ϵ. Mol Cell Biol 20: 4888–4899. Wisor JP (2002) Disorders of the circadian clock: etiology and possible therapeutic targets. Curr Drug Targets CNS Neurol Disord 1: 555–566. Xu Y, Padiath QS, Shapiro RE, Jones CR, Wu SC, Saigoh N, Saigoh K, Ptacek LJ, and Fu Y-H (2005) Functional consequences of a CKIδ mutation causing familial advanced sleep phase syndrome. Nature 434: 640–644.